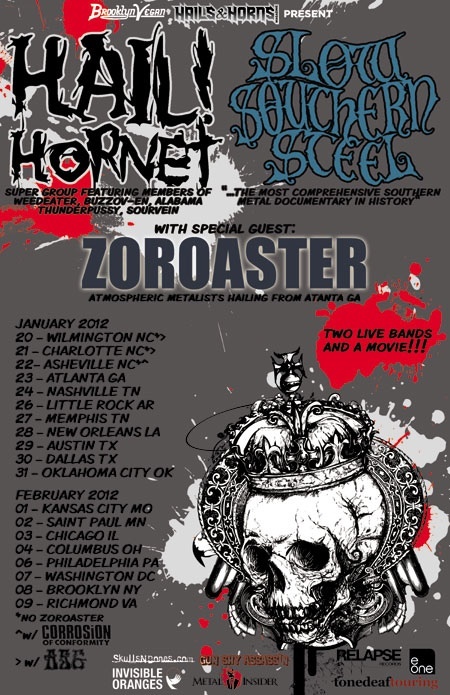 Atlanta doom metal trio ZOROASTER (E1 records) are touring with sludge/doommetal supergroup HAIL!HORNET (relapse) and bringing along with them the acclaimed documentary SLOW SOUTHERN STEEL. SSS was directed by CT of Rwake. If you grew up or live in the South and listen to metal, then you NEED to see this film. 11pm – HAIL!HORNET (relapse) – members of Buzzov*en, Weedeater, Alabama Thunderpussy and Sourvein. Note: “Hail!Hornet’s members include “Dixie” Dave Collins (bass, also from Buzzov•en, Weedeater), Erik Larson (drums, also from Parasytic, The Might Could, Alabama Thunderpussy), Vince Burke (guitars, also from Beaten Back to Pure, Lunch, The Misanthrope Project), and T-roy (vocals, also from Sourvein, Buzzov•en).” – relapse bio. This entry was posted on December 21, 2011 at 8:21 am, filed under News.